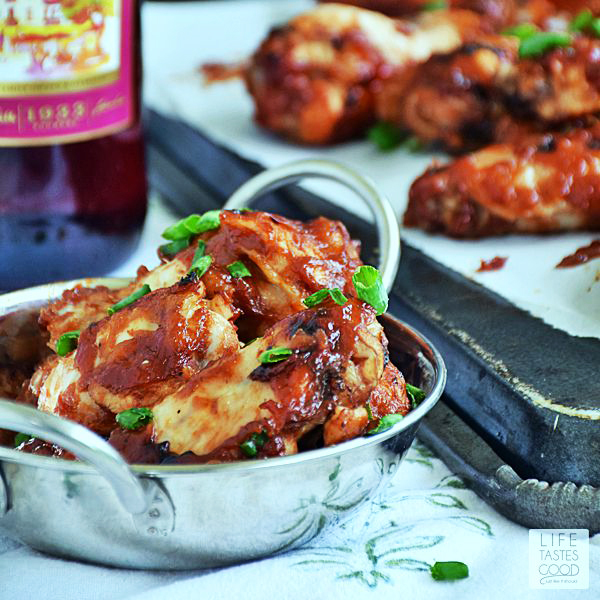 Peach Barbecue Chicken Wings are sweet and spicy little bites of goodness! The fresh peaches sweeten the slightly spicy barbecue sauce, and for an added punch of flavor, I like to dip these wings in a Jalapeno Peach Jam sauce. 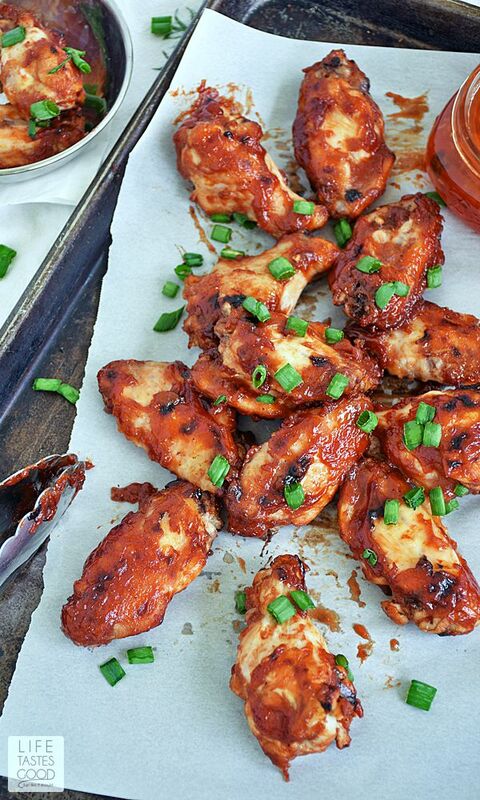 Sweet, spicy, & sticky, these wings are perfect for a Labor Day picnic! Today, the #SundaySupper Tastemakers are partnering with Gallo Family Vineyards in honor of Labor Day. We are sharing our favorite recipes and wine pairings for making the upcoming 3-day weekend a tasty one. Be sure to scroll down past my recipe to visit all of the #SundaySupper Labor Day recipes. Labor Day is a US holiday celebrated on the first Monday in September each year. Dating back to the late 1800's when it was established as an official holiday, Labor Day is traditionally celebrated with parades and barbecues in many cities across the country. Although, Labor Day was first established to pay tribute to working men and women, it has become more known as the unofficial end of summer. The last big hurrah before the kids go back to school and the weather turns colder. Does anyone else find it funny that we honor our achievements as working Americans by taking the day off? Don't get me wrong, I'm not complaining. I've just always found it odd. Of course, here in Florida, by the time Labor Day rolls around, the kids have been back in school for a couple weeks and the weather is far from turning colder. We are experiencing some of the hottest days of the year right now, so this girl is cooking in air conditioned comfort! My Peach Barbecue Chicken Wings are delicious cooked on the grill or in the oven, so it's all good! Chicken wings are always a hit, and I love how versatile they are. You can work with many different kinds of flavors and they always turn out delicious. I picked up some gorgeous fresh peaches at the produce stand that inspired this delicious recipe. The unmistakable juicy, sweet flavor of the peach goes nicely with the tangy, slightly spicy barbecue sauce to create a uniquely delicious flavor. The wings are marinated in the Peach Barbecue Sauce, and then basted during the last 1/2 of cooking time. While the wings are marinating, I whip up a spicy peach jam dipping sauce to take these wings to another level of deliciousness! Be sure to have lots of napkins on hand when enjoying these sticky wings! You're going to need 'em! As I mentioned, it is quite warm here in Florida for Labor Day, so I have to make sure I have plenty of refreshing drinks around to quench our thirst. 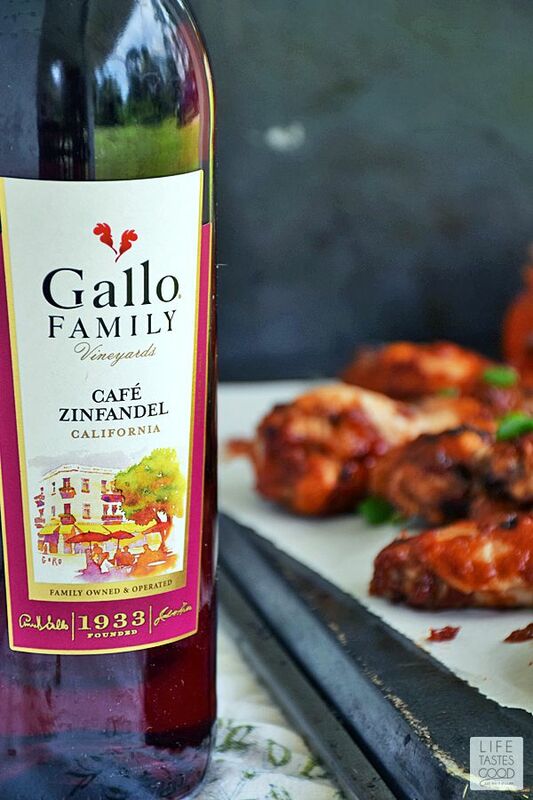 Personally, I really enjoy pairing these wings with Gallo's Cafe Zinfandel. 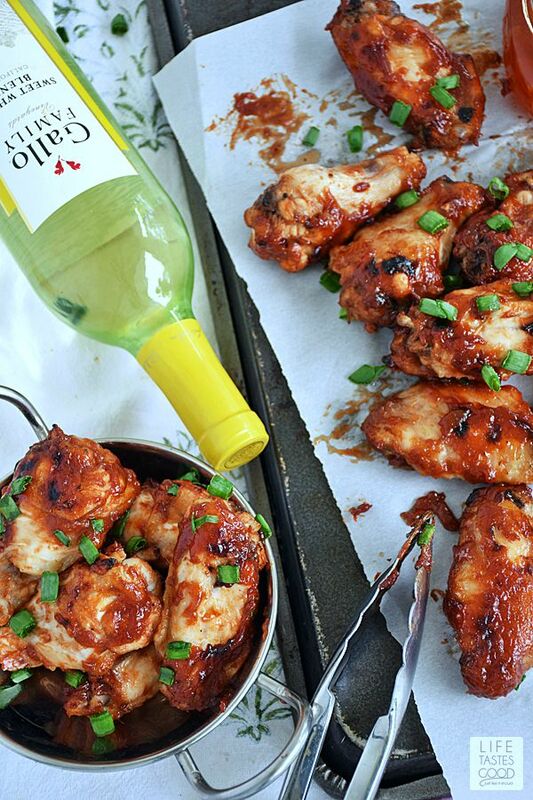 The smooth sweetness of this refreshing red compliments the spiciness of the wings, but if you prefer a white, I recommend the Sweet White Blend. The Sweet White is also a light-bodied wine with medium sweetness making it a refreshing alternative. Serve these wines chilled alongside my Peach Barbecue Chicken Wings and Peach Jalapeno Dipping Sauce for a tasty Labor Day! In a blender or food processor, combine 2 cups barbecue sauce, 1/2 tablespoon freshly minced garlic, chopped peaches, 1 teaspoon kosher salt, and 1/4 teaspoon freshly ground black pepper. Pulse until combined. Give it a taste and adjust seasoning to your liking. If you prefer it more sweet, don't be afraid to add more peaches. Reserve 1/2 cup of this bbq sauce and set aside until ready to baste the wings. Put the wings into a large bowl or resealable plastic bag and pour in the remaining barbecue sauce. Refrigerate at least 30 minutes. In a small saucepan over mid-high heat, combine 1 cup Peach Jalapeno Jam, 1/4 cup apple cider vinegar, remaining 1/2 tablespoon of minced garlic, and 2 tablespoons hot sauce. Bring to a boil, reduce heat slightly and cook for about 10 minutes until the sauce reduces by 1/2. This will intensify the flavor and also thicken the sauce. Give it a taste and add salt and pepper as needed. Remove from heat and allow to cool. It will thicken as it cools. Preheat oven to 450°F. Line a baking sheet with foil and place an oven safe cooking rack on top of the foil. Spray the rack generously with cooking spray.Remove the wings from the marinade and place them in a single layer on the cooking rack. Discard marinade. Cook the wings in the preheated oven for 15 minutes. Turn wings and baste them with the reserved barbecue sauce and cook for 15 minutes more or until they are cooked through and juices run clear. Garnish with chopped scallions and serve with the Peach Jalapeno Dipping Sauce. Enjoy! I think I'd have to make a double batch of the sauce. Wow it sounds heavenly. Love the sweet/hot flavor combo. 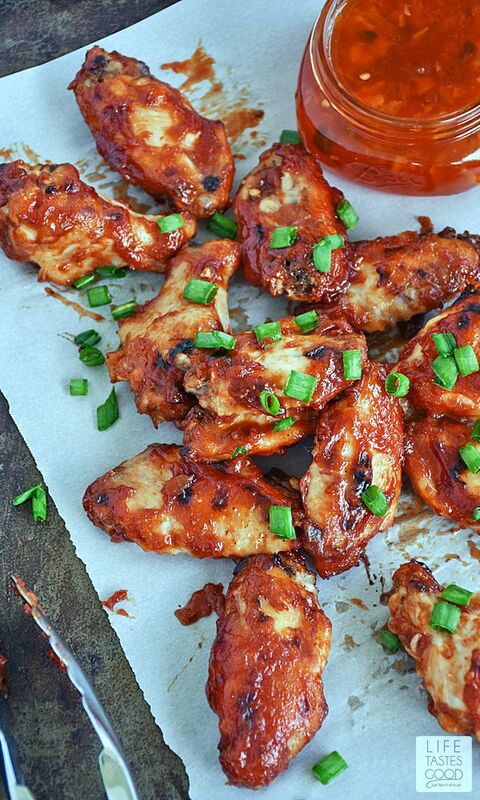 We're always looking for new ways to make wings during football season! It's still hot here in Texas too...waiting for the first real cool snap! I am loving your chicken wings! Great flavors! I love it! I haven't had wings in so long! These sound amazing! I love that you added peaches to your BBQ sauce! What fabulous wings!!! I love the peach flavor BBQ sauce! Great idea. The wings look amazing. Wow, way to rock the summer peaches! Perfectly paired with either of those wines. 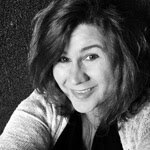 -- Dorothy from Shockingly Delicious. These sound amazing. We love to mix jams in our glazes and marinades.